“The claim that correlations between sunspot activity and global temperature do not imply causality comes from a pair of global warming religionists, enlisted by the American Physical Society to put down skepticism in the ranks about global warming dogma. It is a great example of how intellectually dishonest the eco-religionists are. Do our religionists think that the temperature of the earth is somehow determining the level of solar activity? Do they imagine some mysterious third influence, driving both the solar wind and global temperature? Even when there is every reason to expect the solar weather to have all kinds of affects on global temperature? We literally live inside the sun’s “atmosphere,” its extended corona of solar wind. How could that NOT affect global temperature. Patrick Michaels: “Here’s how Gore works. He’ll cite one scientific finding that shows what he wants, and then ignore other work that provides important context. Here’s a list of his climate exaggerations from his well-publicized July 17 rant, along with a few sobering facts. "Democrats' history of "no" on ANWR"
Gouging? Only by the government. “A picture is worth a thousand words – or in this case ten billion barrels. A group of ten House Republicans just did something few ecotourists have ever done – they visited Alaska’s Arctic National Wildlife Refuge (ANWR) and saw first-hand the 2,000 or so acres of the 19.6 million acre refuge believed to lie on top of America’s single largest untapped source of oil. Anti-drilling activists have characterized this area as an environmental jewel, but the pictures of this expedition show a bleak, flat, nearly treeless expanse of no aesthetic and minimal ecological value. Little wonder the place gets almost no tourists. 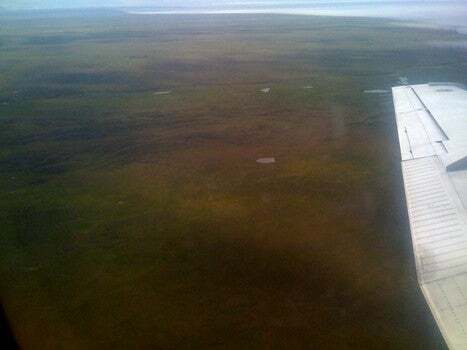 Granted, Alaska has some of the nation’s most stunning scenery – but not anywhere near the areas that would be disturbed by drilling for ANWR’s estimated 10 billion barrels. In fact, even if this portion of ANWR were opened to drilling, the state would still have 140 million acres that are fully protected – an area equal to the entire states of California and New York combined. ANWR drilling has other things going for it as well. The oil rich part is only 70 miles away from the existing trans-Alaska pipeline. There is strong state and local support for drilling – unlike in Washington, both Republicans and Democrats in Alaska are strongly pro-production. And decades of drilling in nearby Prudhoe Bay has proven that oil drilling can be done in an environmentally responsible manner. The Workshop is also open to only the IPCC Working Group 1 Lead Authors [LAs] and Contributing Lead Authors [CLAs] from all four assessments. While the goals of the Workshop are appropriate scientific topics, the closed character of the Workshop and its location perpetuates the exclusiveness of the IPCC process. This small community of climate scientists is controlling the agenda with respect to the assessment of climate change. This is an oligarchy. Climate Science urges that a new group of climate scientists be empowered to lead the next IPCC report. The inbred group of scientists who are to attend the Hawaii workshop, while most are excellent scientists, have a conflict of interest in that they have already presented their viewpoints on the role of humans in the climate system [at the expense of excluding peer reviewed science viewpoints, however …]. "Evidence of variability of atmospheric CO2 in the twentieth century"
“Each possible cause of global warming has a different pattern of where in the planet the warming occurs first and the most. The signature of an increased greenhouse effect is a hotspot about 10 km up in the atmosphere over the tropics. We have been measuring the atmosphere for decades using radiosondes—weather balloons with thermometers that radio back the temperature as the balloon ascends through the atmosphere. They show no hotspot whatsoever. The voluntary program charges FPL customers $9.75 per month – on top of the regular energy bill – to help develop alternative power sources. Nearly 39,000 FPL customers participate in it. According to FPL’s web site, for every 10,000 subscribers, the company will develop 150 kilowatts of solar energy in Florida and buy 1,000 kilowatt hours of renewable energy credits. “”Marine biologists” should know, but apparently do not, that corals evolved during periods of the Earth’s history when temperatures were significantly higher than today’s and when atmospheric carbon dioxide levels were more than 10 times higher, so they are most assuredly not doomed by the trivial changes currently anticipated. Finally, everyone should remember that a scant few thousand years ago today’s shallow water corals allegedly so at risk were dead limestone outcrops, awaiting global warming and the melting of the ice sheets of the last great glaciation to raise sea levels again and recolonization by polyps spawned from areas now drowned, dark and devoid of living surface-type corals. These are adaptable critters occupying whatever niche happens to suit them over the last few hundred million years, over massive ranges and at varying altitudes depending on whatever the climate and sea levels did.” “Oh get real! Coral grief“, JunkScience July 24.